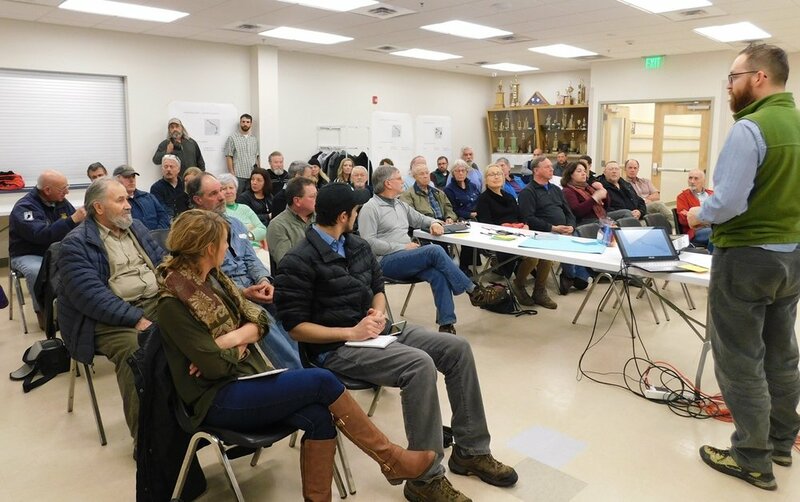 The process by which a local committee of volunteers directed by a professional consulting firm will update this community's zoning laws to guide, among other things, future development was explained at a information session Tuesday. Judging by the more than 60 people in attendance there is considerable interest here in the project. The hour and one-half long session took place at the Emergency Services Building's community room. The zoning project update was directed by David West of the Ithaca-based firm of Randall and West, a firm which works with villages and towns on issues of zoning and green design. The community's zoning law and land use code were created in 1962 but were substantially revised about 20 years ago with assistance from the Adirondack Park Agency planning staff, directed by Jim Hotaling. It has been stressed by planning board members and others in recent years that the law, as it is written today, is badly in need of changes. Opening the session Community Development Consultant Melissa McManus, who has won millions of dollars in grants for the village and town this past decade, explained the zoning update work came about from funding the community won in 2014 to develop a revitalization strategy. As part of that new strategy, a representative from the New York State Department of State, which funded the work, thought that the community's zoning laws were again in need of updating, she told the group. That led to hiring of Randall and West and the appointment of a town and village committee to work with them all this year. The successful grant writer said that later this year the task force will produce “a draft” of a new zoning code which community residents and others will get to review before adoption. A second public meeting will be held at that point in the process. David West explained the zoning update process now underway is “part of a larger process” which began with a state Smart Growth grant and the development of the community revitalization strategy. He said he has been meeting with the community's new land use code steering committee, who include Planning Board Chairman Shawn Stuart, planning board member Jim Merrihew, school district business manager Dan Bower, Councilman John Quinn, Village Code Enforcement Officer Pete Edwards, Matt Kendall, a member of the village's zoning variance board, Trustee Clint Hollingsworth, Town Attorney Kirk Gagnier, retired Sunmount administrator Mary Chartier, Noel Short, acting superintendent of schools in Long Lake, Department of Transportation Engineer Tom Maroun and Main Street resident Jen Beauchamp. The professional began with a discussion of zoning and land use planning in general. He said the current laws “need to be changed” in some areas, because otherwise the community and its leaders could be liable for lawsuits by disgruntled people. He also noted through the zoning process, it gets the person to the “permitting stage” and forward with a project from there. Zoning laws, which sometimes include design guidelines, can strengthen communities by setting rules, he continued. The other planning method, adopted in recent years, is to set aside separate areas for different things, he said. Mr. West said “a planning overview” includes three things: assessing existing conditions, by looking at the current code; creating a new vision within new regulations; and updating procedures in the existing code, many of which are likely outdated by law or common practice. Mr. West said Tupper's current code is “hard to deal with.” One table on one page sums up all the zoning uses, for example. The existing zoning law here also contains what he called “a huge list of special review uses,” which call for each application to be subject to a public hearing. “The courts have not looked well on special review uses” and it could result in the town and village being liable. He said a better way is to create a list of permitted uses (types of businesses) and decide how many you want to see in the center plan. In the existing plan, a person can't open a hair salon in the village or town without a special review use permit. “It's up to the planning board (for every type of business proposed) and that's not a good way to get your storefronts filled, said the consultant. Mrs. McManus noted at that point that the state has seen “a real evolution” in zoning in recent decades. Mr. West said that one of the benefits of adopting an APA-approved land use code is the gaining of local jurisdiction of what are called Class B size projects. Typically these are moderately sized projects. He noted, however, that comments to him already indicate that most community leaders are not interested in that. Mr. West said Tupper Lake has adopted some excellent architectural design and site guidelines, as part of its revitalization strategy, and they need to be considered in any new zoning plan. He pointed to the design work formulated in recent years for future Demars Blvd. development. He listed the various categories in the existing law, each which come with their own set of setbacks and minimum lot sizes. They included: high density residential, which is most of the village, high density residential special zone, medium density (one acre minimum lot size), low density, medium density shorefront (three acre minimum lot size), rural residential (eight acre lot minimum), low density shorefront residential, residential/commercial (mix of residences and businesses), highway residential/commercial (one acre minimum lot size), commercial, shorefront residential development, conservation zone, open space recreation, recreation/timber and the planned development district, created for the Adirondack Club and Resort. Mr. West said the job of the planning board would be clearer and easier if there were specific permitted businesses in commercially zoned areas. When those types of businesses come before the planners, it is what is called a “site plan review.” That way the board could review the applicant's plan and approve it without a public hearing and a month's delay. He said some types of businesses which are not typical to a commercial district could be kept in the special review use category, where the planners would examine on a case by case basis and who may reject it if there are good grounds. One such special review use, he said, might be the operation of a dog kennel, where there may be concerns for the neighbors. “The planners may require conditions for insulation for noise,” he gave as an example. Mr. Lanthier said a more pressing need for the community is addressing the out of date and deteriorated signs of many businesses here- particularly those on Demars Blvd. Mr. West new sign guidelines will be part of any new zoning ordinance here. Retired high school principal Jim Ellis, a long time member of the planning board here who worked extensively on the 1990 revision to the current laws said the APA staffers were instrumental in achieving those revisions. There are still many flaws, including the fact timber harvesting is a use found in every land use category, he told Mr. West. The biggest challenge with zoning, he said, is administration. “You can have the best plan,” but you need enforcement. He said one building inspector for the entire community is not enough. He recommended submitting any new zoning and land use law to the APA for its adoption, so the community can obtain jurisdiction over what the state agency calls Class B-sized development projects. Little Wolf Lake resident David Reed asked if the new code would have less rules to follow. “Is the goal to get an APA-approved plan?” Mr. Reed pressed. “This is an APA-approved plan, as it currently exists,” Mr. Ellis told him. Pointing to the uptown business district between Stewart's and Wawbeek Quick Stop, Planning Board Chairman Shawn Stuart wondered what is the purpose in that area of establishing a minimum lot size, since no place complies. “What's wrong with a tiny store?” The more the better for the community, he stated. Mr. Stuart wondered that within the current zoning, if someone could build a new store in the vacant lot beside Trillium Florists- given the required set backs and parking requirements, even in the current law. Mr. West thought someone could, with the current processes in place. Betty Woods thought there should be a category in any new zoning code for churches and public services buildings. She was told in the current code they are called “assembly”- defined as places where people gather. Mr. West said that the various definitions in the existing code- many of which may be outdated- would be examined for clarity. Realtor Rob Gillis called for the creation of more commercial zones- and particularly the entire route from the village down Route 30 to Moody where the Adirondack Club and Resort will be built. “All of Moody should be commercial/residential all the way to Blue Jay Campsite,” Mr. Gillis reasoned, saying the entire corridor is serviced with village sewer and water. Mr. West called Rob's point a good one, saying the availability of water and sewer services should always be part of lot-size and use discussions in zoning. Mr. Gillis said there should also changes made with building set-backs in the various zoning codes, most of which, he said, are not realistic here. The consultant suggested the community may want to consider asking the APA to make the Moody corridor part of the less restrictive “hamlet” zoning, like the village. Planning board member Bob Collier suggested that things like sign and lighting rules be “addressed more broadly” and perhaps separately than just in the code. Jim Ellis also recommended there be only one zoning board which grants variance to the code here in the details of the revised plan, rather than separate village and town ones. Jim Lanthier suggested the group look at the recent changes Lake Placid and Saranac Lake made to their codes. “They are quite good!” he told him. Mr. West said the group would examine their laws in the study process. There were cards distributed that evening for people to jot down their ideas and letters can be sent to either the town or the village. As a final exercise that evening the attendees were encouraged to write down all the “permitted uses” they thought should be included in the four main commercial/residential zones and also those types of business that should be examined as a special review use, which requires both planning board and public scrutiny. Mr. West called that evening's room full of people “a great turnout.” Typically in many communities, he said, you have to pull teeth to get people to attend.